My children had just gotten safely home after driving an hour through smoke when I saw the image. The girls had been out camping, their father sending me a tense message when the sky began turning black. I couldn’t have been more relieved to see them. 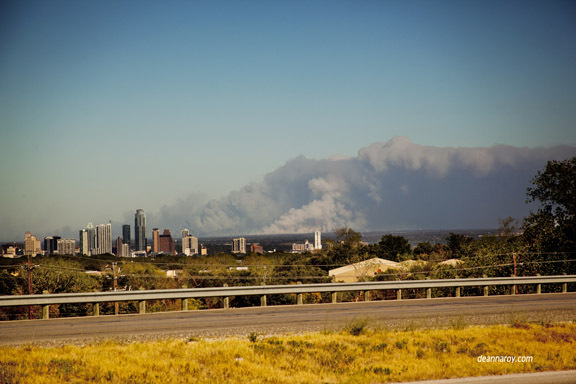 We were driving up Loop 360 (Capitol of Texas Highway) near Westlake when we saw the skyline of Austin backed by smoke. I just happened to have my Canon 5d Mark II in my lap because I had been shooting around town for holiday portrait locations. The girls wanted to scale the fence and climb the hill, but trespassing was not the order of the day, so we instead drove back to our original sighting on the highway. By that time, the fire was actually a little more dramatic. Here is an unfinished and uncropped version of the image. Here is a Google Map of the location. The time stamp on the image is 5:18 p.m. on Monday, Sept. 5. I bracketed the shots, intending to do an HDR (High Dynamic Range) image from it. The grayness of the air made the image lower contrast that I would have liked and it was a little yellow, so I knew it might need adjustment. The wind was terrible and the side of the road didn’t feel too safe, so I jumped back in the car, knowing color and contrast was an easy fix. When we got home, studying for tests and making dinner intervened. I definitely did not have time for an elaborate HDR from handheld frames, and almost didn’t do anything with the shot at all. But my fiance asked if I’d upload it to Facebook, so he could share it with his family in California. So I hurriedly copied the shots to my computer. I cropped out the guard rail and bumped up the contrast so that the cityscape would show through the haze. At the last minute I tossed my web site on there, planning at that point to maybe blog about it, but also to differentiate my image from the hundreds I expected would be taken of the same scene. I had no idea that this particular image was ephemeral, and that within a few hours, the smoke haze would spread so far and wide that the city skyline itself would almost disappear. I uploaded it quickly to Facebook. Just a few hours later the phone began ringing. Television stations, wanting to use the image on the evening news. I’ve had some 1500 messages, calls, emails, and comments in the last 40 hours. Most every news organization has contacted me. CNN featured it on the home page and now I’ve gotten calls about it being used in television ads for the Red Cross. I have not accepted any money for it, nor am I doing prints or selling the file. Sometimes I stare at the photograph and wonder why it affects so many people. I see the truly amazing images coming out of the wildfires — incredible feats by fire fighters, homes that are down to pipes and bricks, and think — this is nothing. But I suppose that maybe the photo turned the tide somehow. People saw it and thought, this isn’t a small thing. It’s big. It’s bigger than the city. And for two days, that particular fire has been 0% contained. When the photo was taken, some 30 homes had been destroyed. Now it’s 500 and counting. I think this picture made people realize — they need help. So I hope most of all that if you see it, you donate to the Red Cross of Central Texas. They need it. People need it. There are so many ways to lose things in this life, but fire is all encompassing. There is nothing left to dry out or collect or salvage. It’s gone. Everything. Gone. If you are connected to a fundraiser or other event for the evacuees of this fire, the answer is yes, yes, of course you can use the photo. As long as you are using it to good purpose and not reselling it, I’m okay with it. Run with the file you have or ask me to send you one resized to fit your project (most 8.5×11 flyers will be fine with what you saved, but bigger projects or high def video need a higher res.) You can comment or email or link to it so I can see your wonderful work, but honestly — I’m just amazed by what you are doing — so go, make your own difference in this crisis. I am a part of a group of photographers who will be donating family portraits to families who have lost their home so that they might begin rebuilding their memories. Deanna, I saw your Bastrop Fire from Loop 360 picture on this web site http://www.towerpromos.net/ that is selling Pray for Rain T-Shirts. Thought you might want to check it out! Regarding the Recapturing Memories Project – what is the best way to get the word out to the families? I checked the Facebook page and noticed it was a closed group and not being a photographer I did not ask to join. But I would like to help pass the word along about your awesome project. I personally know two families that lost every thing in the Bastrop fire. Please let me know how I can help. And a BIG THANK YOU for this project. For families applying for the service, click “apply” at http://recapturingmemoriesproject.org/. I love your skyline photo. I would like to use it of on a poster for GIS day (www.gisday.com) at our agency the Department of State Health Services. We did a community assessment in Bastrop and this picture would complement it well. Do you have a higher res uncropped I could use?